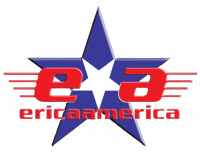 Ericaamerica is an Australian Menswear label started by Erica Wardle and Lucas Bowers in 2001. The label won the prestigious Mercedes Start Up Award in its inaugural year. The label presented the first all menswear individual collection show in the history of Mercedes Australian Fashion Week, and was the first Western Australian label to do runway at New York Fashion Week in September 2005. in the same year the label launched its first range of clothing for women: "Dressage by ericaamerica". An instant hit both in Australia and overseas the line was a featured show on the UK Vogue website and is now stocked in stores around the world. The female collection is the antithesis of the male range celebrating all that is feminine, "When ericaamerica pull off their show. they're taking us back to tea parties and secret gardens." ericaamerica is known for its sharp technical cuts and classical old world style which has been referred to, by critics, as "uber masculine".